Set back a little from the main street of Oranmore, in the centre of the town, the Coach House Hotel is home to two main dining options. The House Bar Bistro is good for informal family dining. The more elegant choice, however, is always Basilico Restaurant. Basilico has a very extensive a la carte menu with plenty of choice, from which we have had many memorable meals. Soft polenta with grilled sausages and wild mushroom ragu, pearl barley risotto with porcini mushrooms, leek, and melted gorgonzola, sharing platters piled high with Italian and Gubeen Smokehouse cured meats, baby buffalo mozzarella, stuffed olives, marinated peppers, Pecorino cheese with a hit of chilli, tiny onions seeped in balsamic, and the most sublime polenta chips, light and fluffy and scattered with a snowfall of parmesan... it's a lovely spot to explore the cuisine of Italy. Fabiano Mulas and Paolo Sabatini, the owners of the restaurant for over a decade, are purists when it comes to sourcing the highest quality seasonal ingredients for their dishes. As co-owners, these native Italians have a wealth of experience gathered from working around Europe and further afield. These two have worked together for many years, and they are firm believers in supporting small, rural, businesses in their adopted homeland. Both Mulas and Sabatini grew up immersed in their native food culture, with Fabiano coming from his family farm in Sardinia. Sardinian cuisine is a celebration of natural products from the land and their surrounding sea. It unites dishes from the ancient pastoral and farming traditions with those based on fish and seafood, and the flavours of the natural ingredients are exalted by the unmistakable aromas of the island’s Mediterranean ingredients. Green landscapes and enchanting medieval villages characterise the Tuscia zone and its capital, Viterbo, chef Paolo Sabatini's home town. It is an oasis of good food where the rhythms of life from the mountains to the sea are dictated by nature and the age-old customs of peasant life. A notable farming centre, where olives, wheat, and grapes are farmed, the latter yielding such highly prized wines as Montefiascone, Gradoli, and Vignanello. The landsape is shaped by its volcanic origins, leaving magnificent lakes in extinct craters. Flat in the north, the land becomes more hilly up towards the Cimini Mountains, then slopes down to the River Tiber. A sandy shoreline edges this area of the coast with its crystalline waters. These are the landscapes that inspire the menus at Basilico. Sabatini, as head chef, loves to experiment with flavour and the combination of local produce and Italian ingredients gives his menu that creative edge. Among Basilico’s suppliers are Brady’s Butchery in Athenry, seafood is sourced from Gannet Fishmongers, Green Earth and Curley’s supply fresh vegetables, and all are known locally for the high quality of their produce. Refreshingly, courses are broken down in the Italian style, with antipasta, primi piatta, and dolce. The recipes are authentic and ingredients are the best of local and Irish with imported specialities where no substitutions will do, mainly cured meats and cheeses. Of course, they also have a large list of Italian wines, as well as some classic aperitifs. Basilico imports olive oil especially from Calabria and all dishes are infused with the flavours of their homeland. Basilico is a truly authentic Italian dining experience, cooked and served by Italian chefs and staff. The dining room is decorated in elegant shades of gray and cream, and the chairs are comfortable cream leather. Tables are well spaced and when seated, quickly furnished with menus, bottled water, and a basket of homemade Italian bread with a good olive oil and balsamic. The description of the dishes speak of authentic recipes and ingredients, the carbonara has no cream, truffles feature regularly, and chestnuts also in their season. There is good value to be had at lunchtime, and Sunday lunch especially. A visit here is never complete with out a starter of calamari fritti, these crispy squid rings are served with big wedge of lemon and a very garlicky mayo with lemon and chilli shared between us. The specials on Sunday boast a roast lamb or rump of beef option, but we go for the spring tortellini, a fresh egg pasta filled with ricotta cheese with asparagus, broccoli and garden peas in a light basil pesto and parmesan cream sauce. We also order a baked cod dish on a bed of risotto with a dill and lemon sauce. Savino Musciagna, from Bari in the Puglia area of Italy, mans the traditional Italian pizzeria. Back in Puglia the region’s star attraction is its food and the Pugliese take their pizza very seriously. Indeed, Musciagnais is no exception. 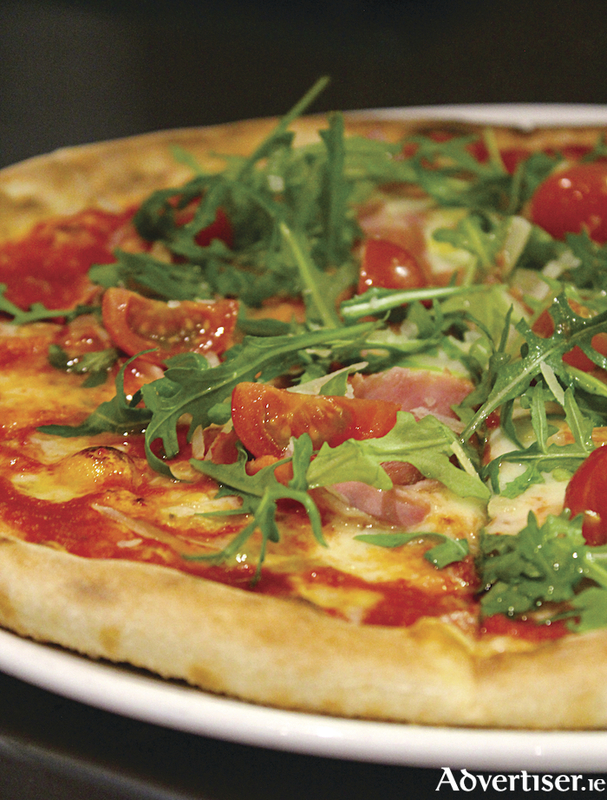 A prosciutto and rucola pizza that we sample, rocket, parma ham, cherry tomatoes, and grana padano shavings, then annointed with a little olive oil, is one of the best we have come across. We finish with a nice pannacotta, a chocolate brownie, and a rather beautifully presented affagato. It comes as no surprise that Basilico have been awarded a prestigious AA rosette, acknowledging it as a kitchen that surpasses expectation and stands out from others, a rare achievement for an Italian restaurant and a testament to the dedication of this hard working team. This is quite possibly the best Italian food you can get in Ireland. It is certainly up there with other favourites, and is fully deserving of all the praise it attracts. Heres to another decade of success for Fabiano, Paolo, and their team. It is worth a trip out from Galway for what is certainly the best Italian food in the west. Basilico Italian Restaurant, Main Street, Oranmore. Phone: 091 483693.